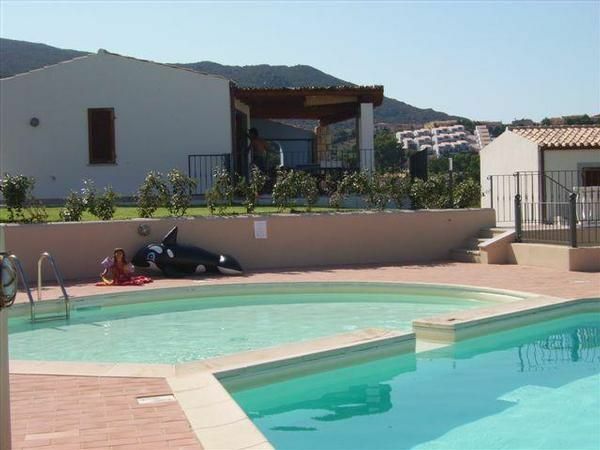 New (built in 2010) and tastefully decorated two-story villa for rent in Badesi on the Sardinian north coast. The villa is located 500 meters from the city center and 1.5 km from a beautiful 8km long sandy beach. The villa can accommodate up to six people + 1 sleeping child in the cradle. Ground floor: 2 bedrooms (160x190), one bedroom with bunk beds, bathroom ,. , Parking and a separate laundry room. First floor: large kitchen and living room, bathroom and living room with sofa. Two independent covered terraces. Outside there is a dining terrace with spectacular views over the sea. Garden access from both levels. Free access to the large communal pool. Entrance to the ground floor and first floor. Air conditioning, fan. Kitchen fully equipped. La Vigna Residence is a property of about 25 apartments with pool, about 2 km from the sea and 500 meters from the city center. Overlooking the town and the sea up to Castelsardo. House with garden and sea views, in Badesi, 18 km from Castelsardo, 15 km from Costa Paradiso, 8 km away from Isola Rossa, and 50 km from the center of Santa Teresa di Gallura, in a quiet position, 2 km from the sea. For shared use: swimming pool (10.06.-30.09. about). Parking by the house. Grocers 300 m., Post office, bank, pharmacy 600 m.
- Large living room with kitchenette. - 2 bathroom with shower / bidet / WC. - Please notice That the Internet includes 5 GB. Afterwards You may be required to paid! In the vicinity there are many beaches. Cot for children: once per object for rent at a price of 25 EUR (optional). Towels: once per person for rent at a price of 8 EUR (Mandatory). Intermediate cleaning: per object and day Costs amounting to 150 EUR (optional). General: per person and week Costs amounting to 15 EUR (Mandatory). Cot (once per object, Costs amounting to 25 EUR). Intermediate cleaning (per property and day, included in price 150 EUR). Parking facilities (per property and day, included in price 0 EUR).